It turns out I’m a contributor to a national, rather, global crisis! I’m guilty of buying and preparing more food than I eat and tossing the leftovers into the trash. I didn’t think much about it until now. A recent report from the National Resources Defense Council (NRDC) says that Americans waste 40% of the food in the U.S. each year – that comes to a whopping $165 billion essentially tossed into the garbage – the single largest component of solid waste in U.S. landfills. 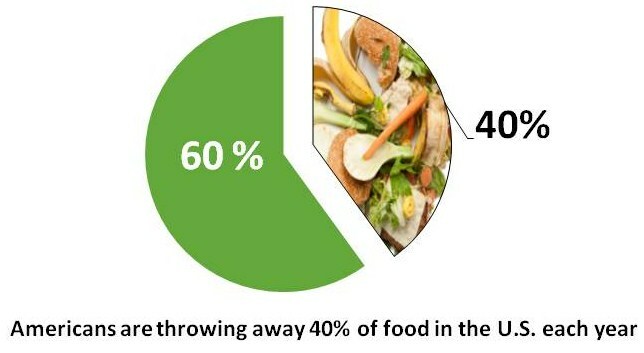 The average American family of four ends up throwing away the equivalent of $2,275 of food each year. There has been a 50% increase in food waste since the 1970s. A 15% reduction in the amount of food wasted would save enough to feed 25 million Americans each year…25 MILLION! The report states that the cause of losses in the food system are complex but cites several key problematic areas. For starters, grocery stores and other retailers lose $15 billion each year in unsold fruits and vegetables alone…about half of our national supply and more than any other food product. Consumers are also a major contributor to the problem as we order too much food in restaurants and don’t eat our leftovers at home – all of which goes into the garbage. Wasted food also leads to wasted resources. As the report points out, land, energy and water are used to produce this food that is never consumed. More shocking statistics: 25% of all of the freshwater consumed and 4% of the oil goes into producing this food and 23% of the methane emissions in the U.S. are generated from food waste. Europe is already getting its act together. Earlier this year the European Parliament passed a resolution to reduce food waste 50% by 2020. A public awareness program in the United Kingdom has already contributed to an 18% reduction in avoidable food waste. I can do better with my food planning and together we can also take steps to reduce waste in the food system. We often try to figure out how to grow more food but, as this study points out, we can also feed more people by wasting less food. We can put less strain on our natural reasons by maximizing our post harvest yield by driving waste and shrink out of the supply chain. Intelleflex has been advocating how pallet-level temperature monitoring can enable things like uniform pallet building and prioritized routing that helps ensure delivered freshness and reduce spoilage from field to fork. The beauty of it is that, by implementing this approach, food producers make more money. It’s a win win. You can learn more about this solution here. This entry was posted in Perishables and tagged feeding 9 billion by 2050, food waste, NRDC article. Bookmark the permalink.